Please note, only the executive committee has the ability to send emails out to all the members. Sending out the Club Newsletter. 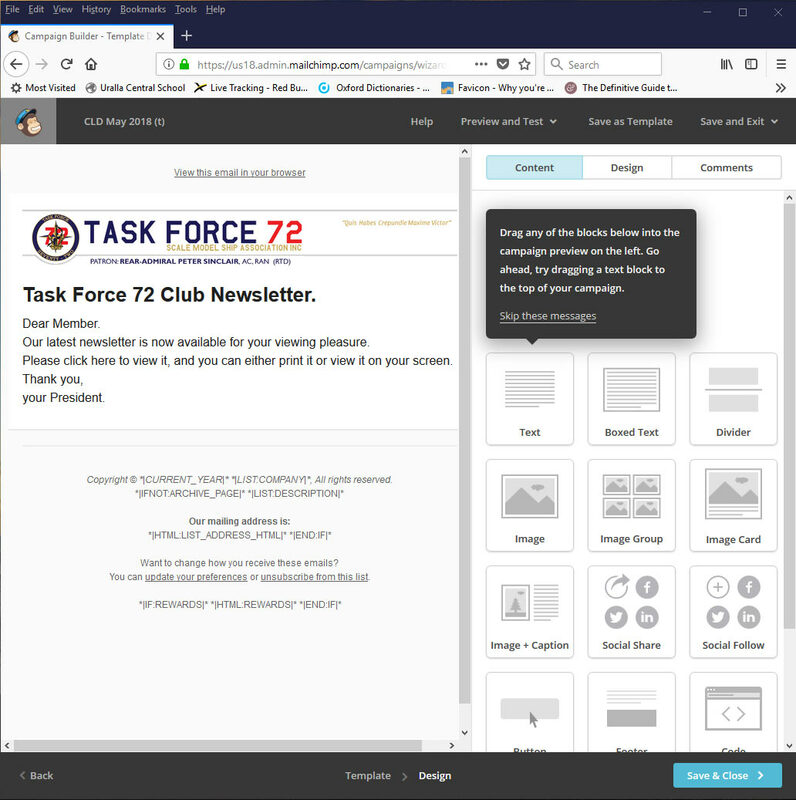 In order to send out the Newsletter, you need to first upload the final pdf version of it to this website and then use the generated link to email out to the members. The instructions for this is as follows. 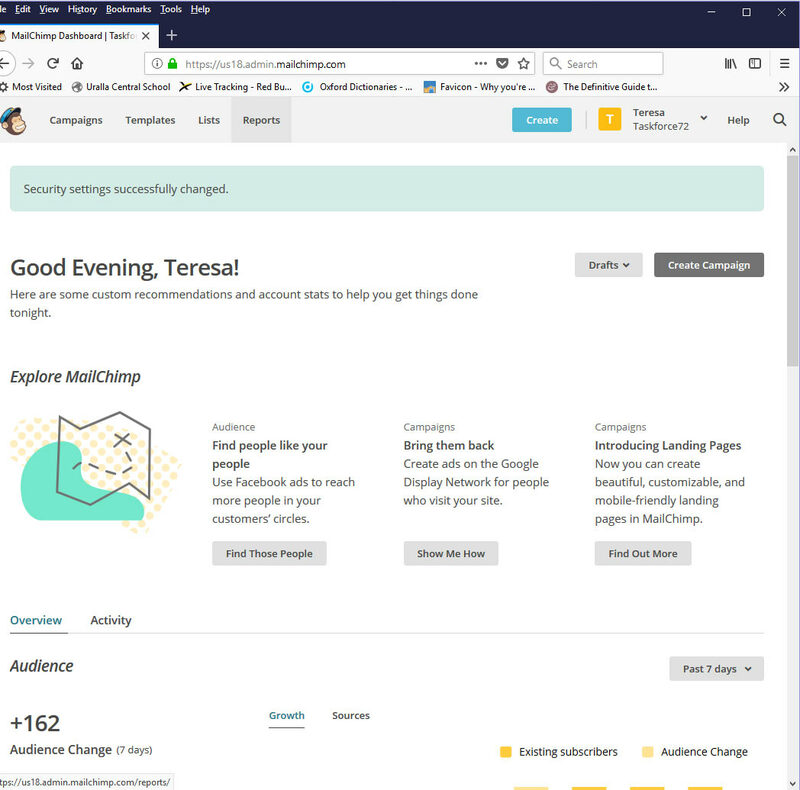 Click on the “Add New” button. 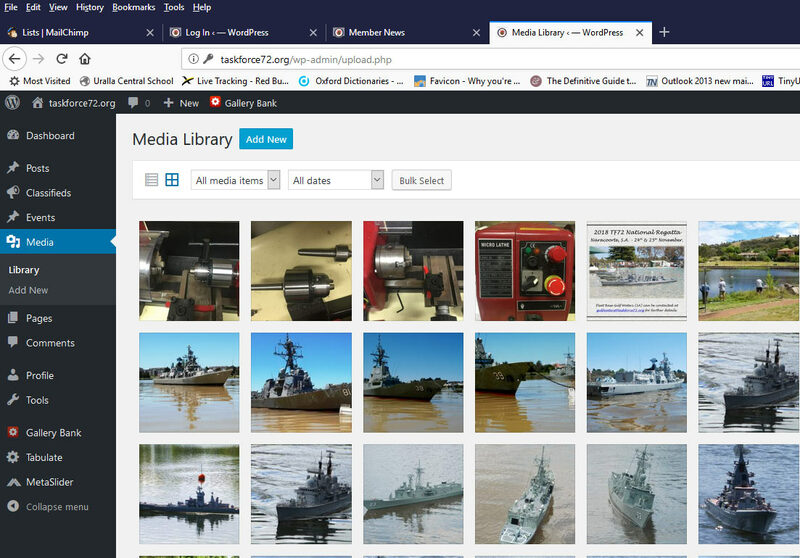 It will bring up the “Browse” dialogue, so find the pdf file and drag it across. 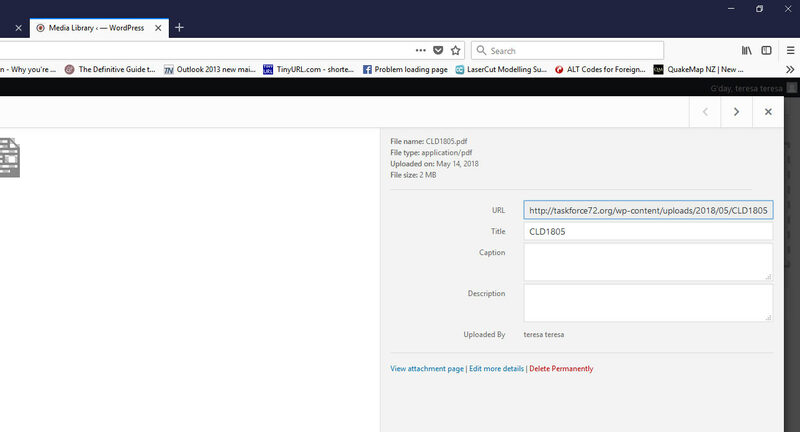 Then click on the file, to get the URL for later use. You have now placed the file on the website, so you can now log out of the administration area. 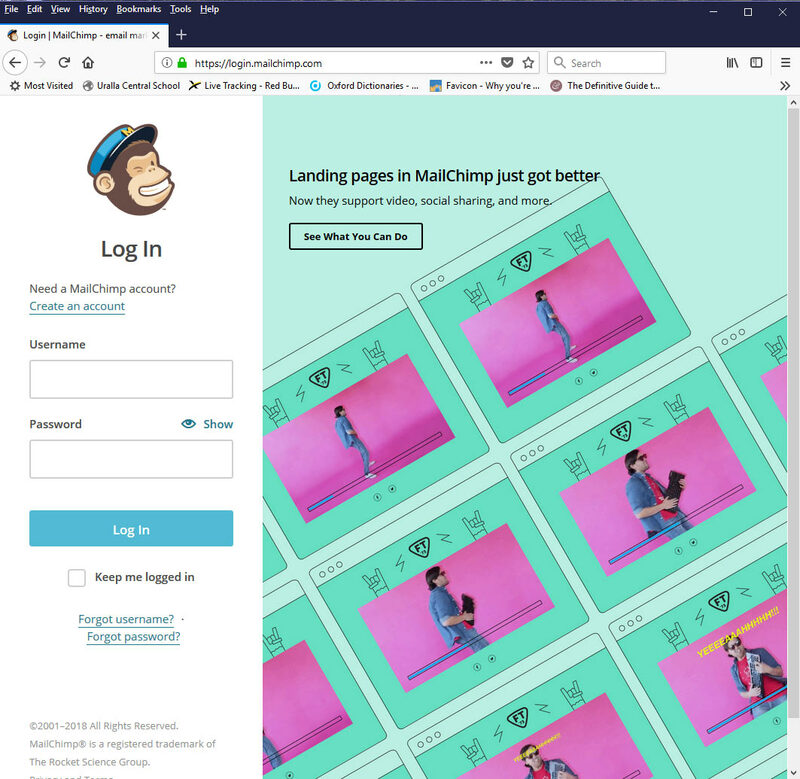 You will now log in to MailChimp and send the email out to all members from there. Using your provided userid and password, Log in. One of the first few times you log in, you may see this screen. 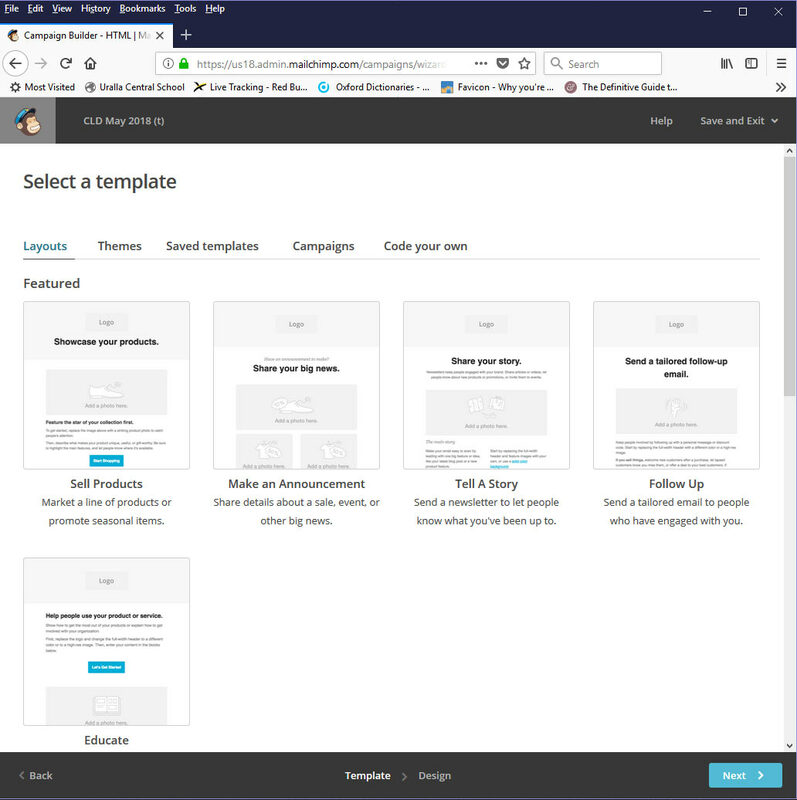 Deal to this page as you wish and then it will bring you to the following screen. 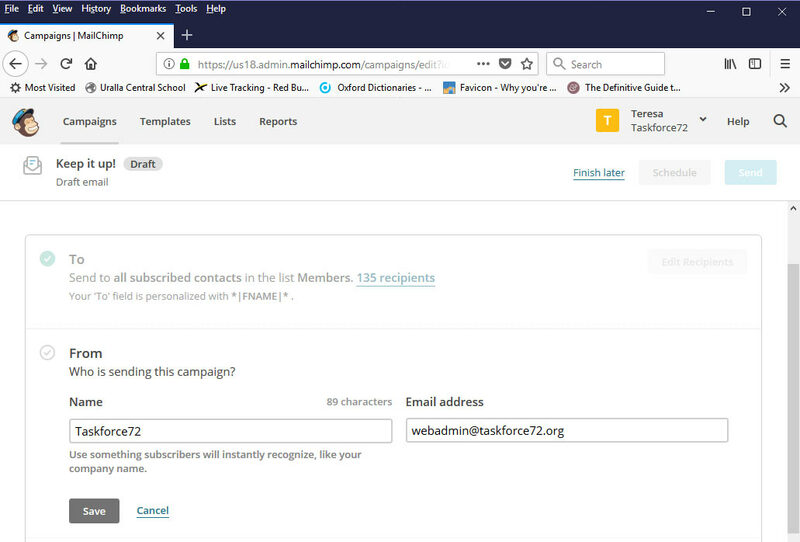 To send out an email to all the members, select “Campaigns” from the menu near the top of the page. 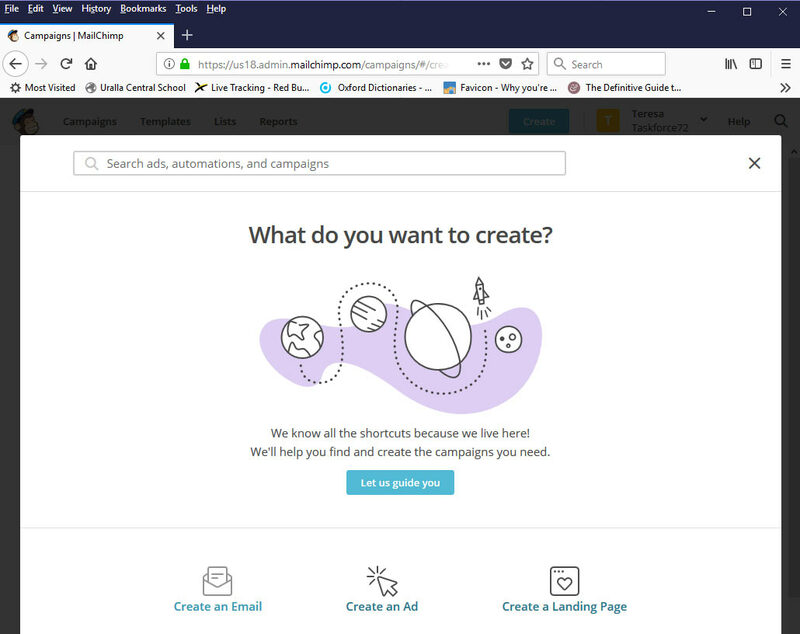 To send out an email, click on the “Create Campaign” button. 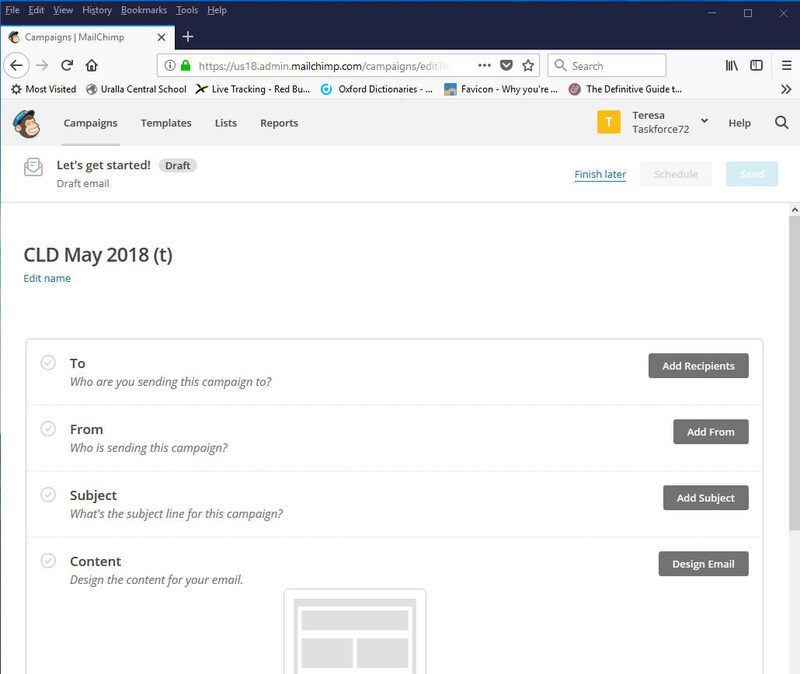 Click on the “Create an Email” icon down the bottom left of the popup screen. 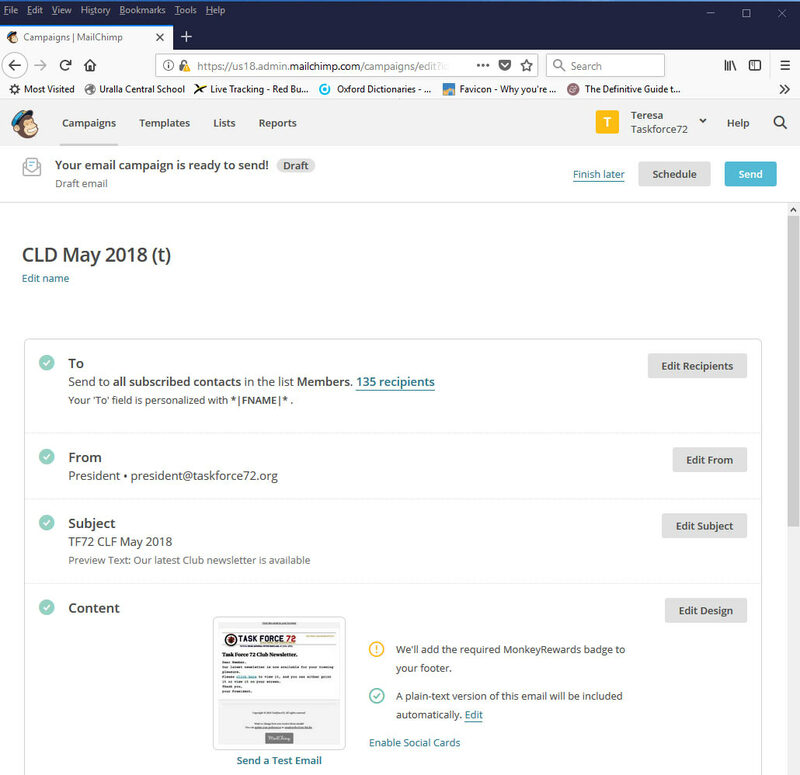 Give the Campaign a name – for instance, “CLD 2018 May”, leave the default as “regular” up the top of the screen, and then click on the Begin button. You will then be asked a series of questions. 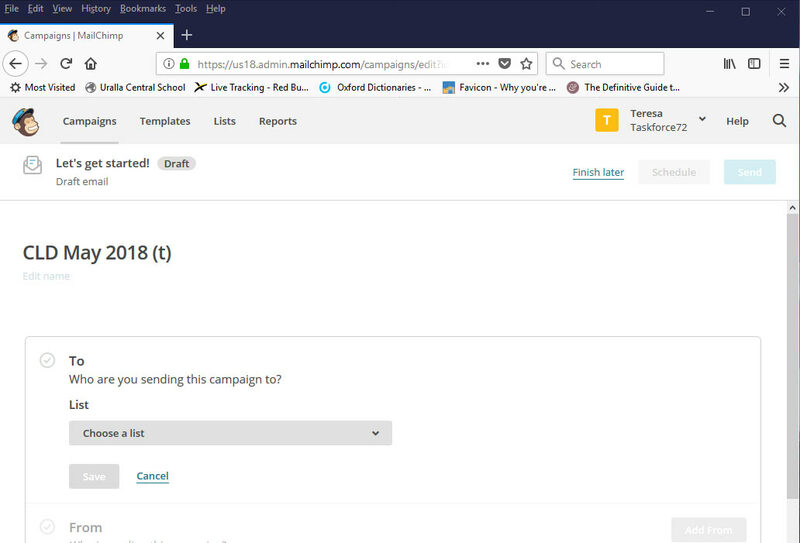 Click on “Add Recipients” – you will be asked to select a list. Leave the “Segment” as is (all subscribers). 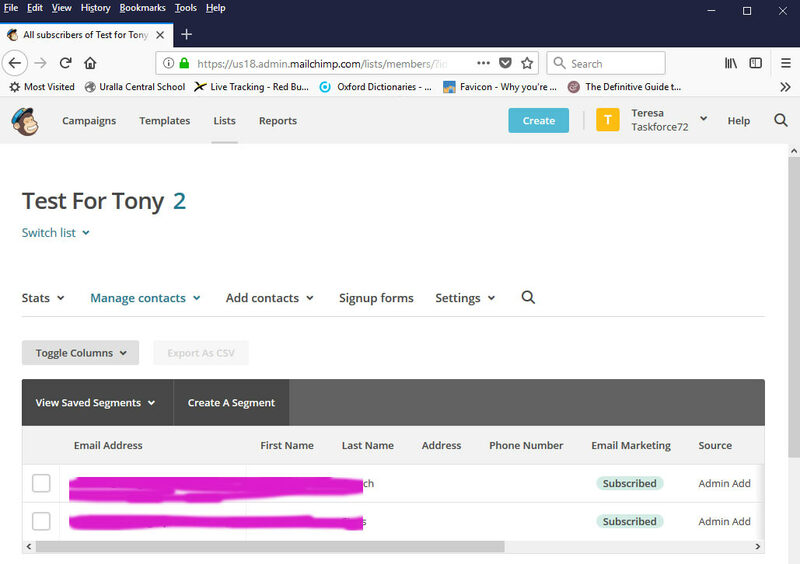 Personalise the “To Field” – you can make your email personal to each subscriber by using the FNAME and/or LNAME tags. 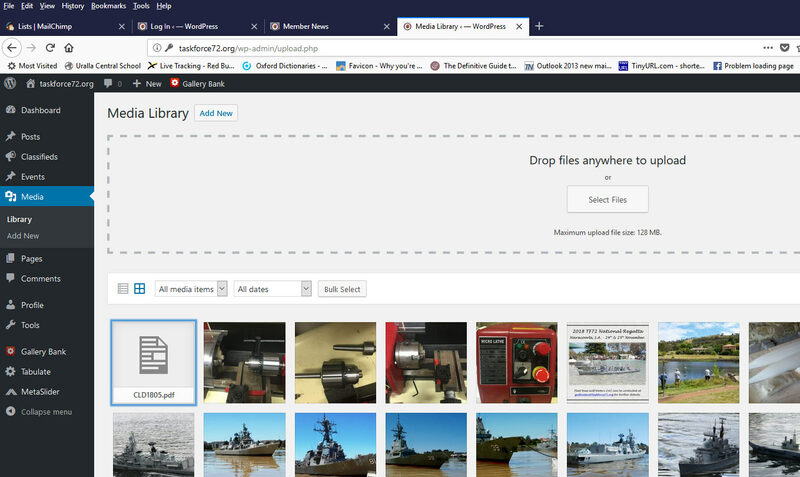 Click on the Save button when you are done and then you can edit the “From” field. 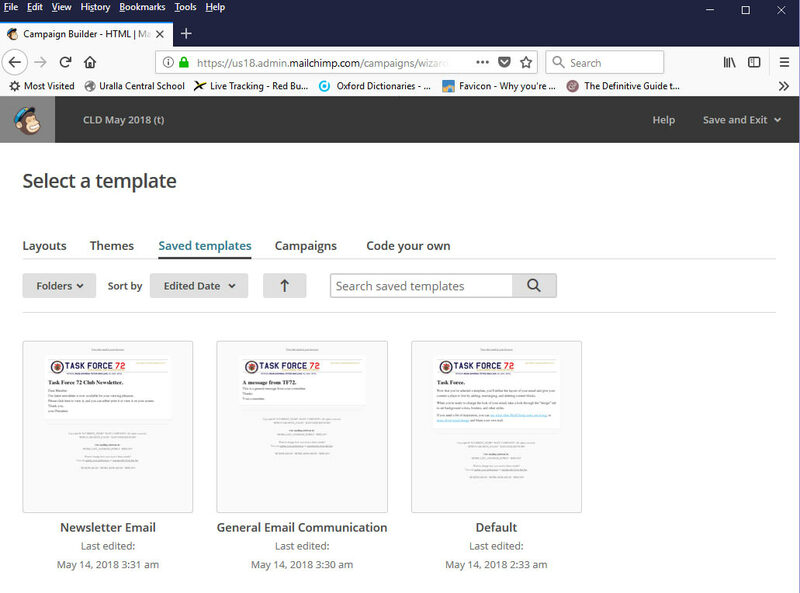 Do not choose any of the shown templates, but instead go to “Saved templates” near the top of the page. 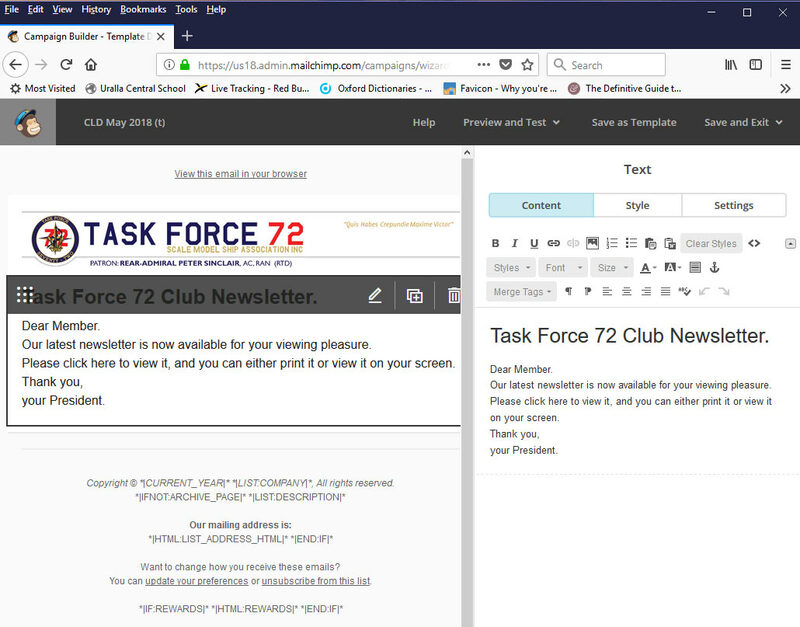 Don’t worry about the boxes on the right hand side, just click on the block on the left hand side with “Task Force 72 Club Newsletter”, you will then see the right hand side change to what you wish to update for this time. 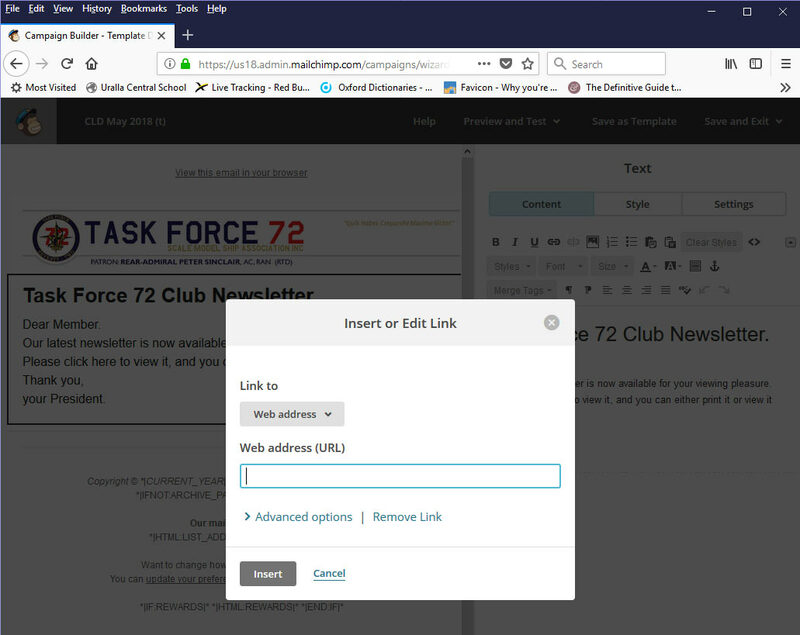 Then enter the whole link to the pdf from before… all the way from the http:// … to the .pdf Then click on the Insert button and you will notice the selected text has changed to blue on the left hand side of the screen. 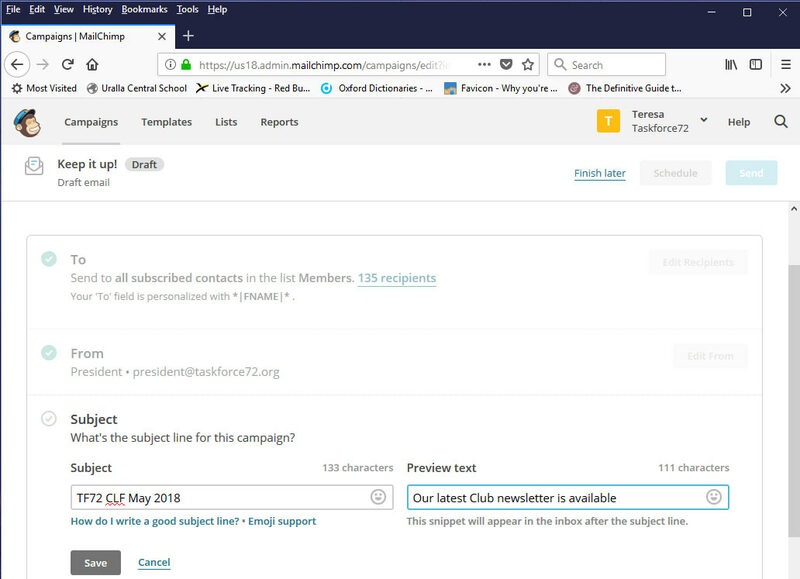 Your email draft is now created, click on the Save & Close button at the bottom of the screen. You just need to send it now. 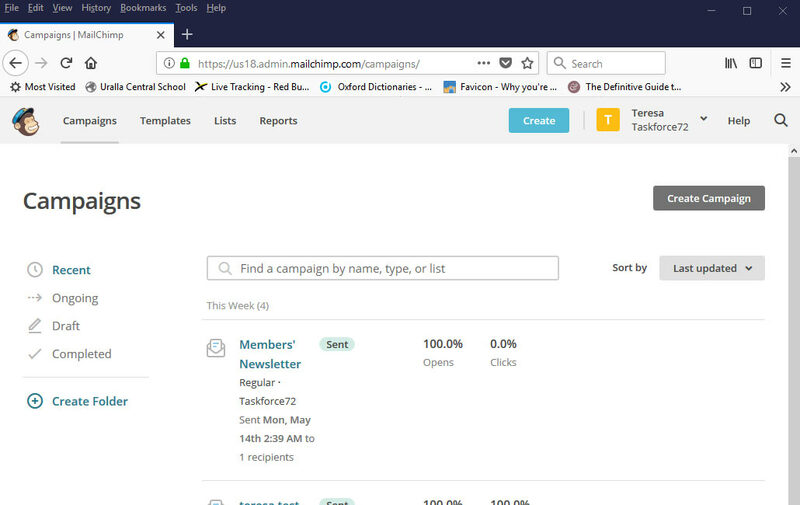 To see the results and stats from your email, find the campaign and you will be able to click on the “View Report” button that appears to see the stats. 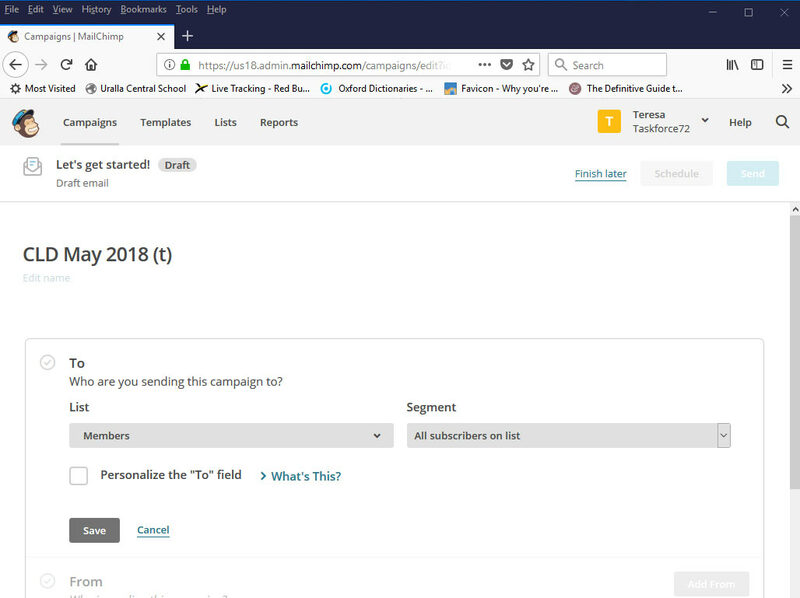 Find the campaigns titled “Member’s Newsletter” (note, this may not be near the top of the page, depending on how often emails are sent out – scroll through until you find it). Sending out other emails to the members. 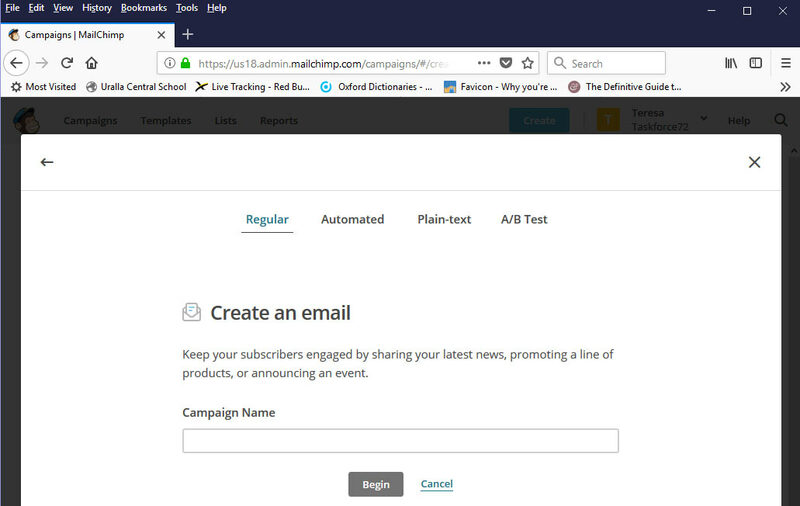 Administration of the Email lists. 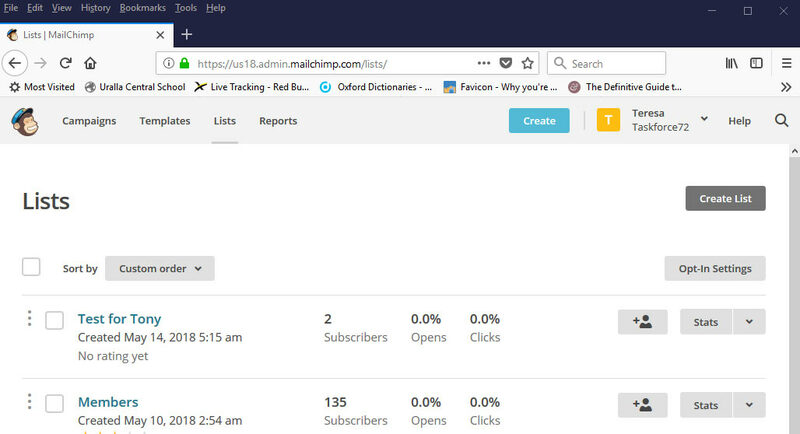 Adding users to a list manually. 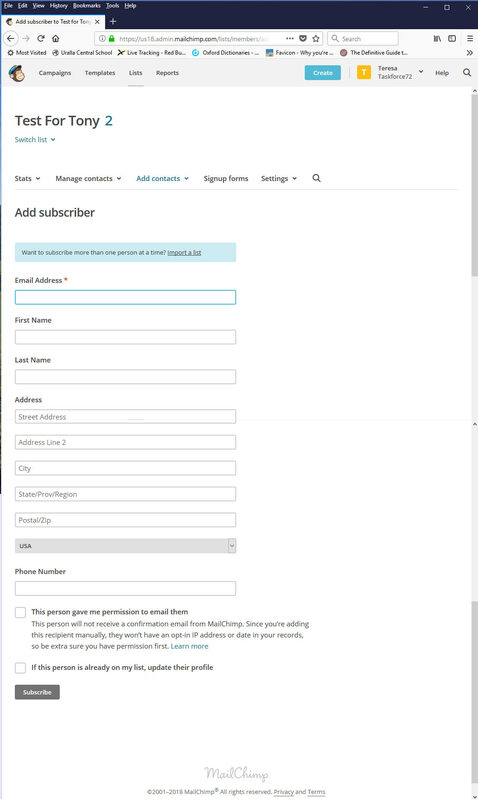 Then select the list you wish to add a user to. 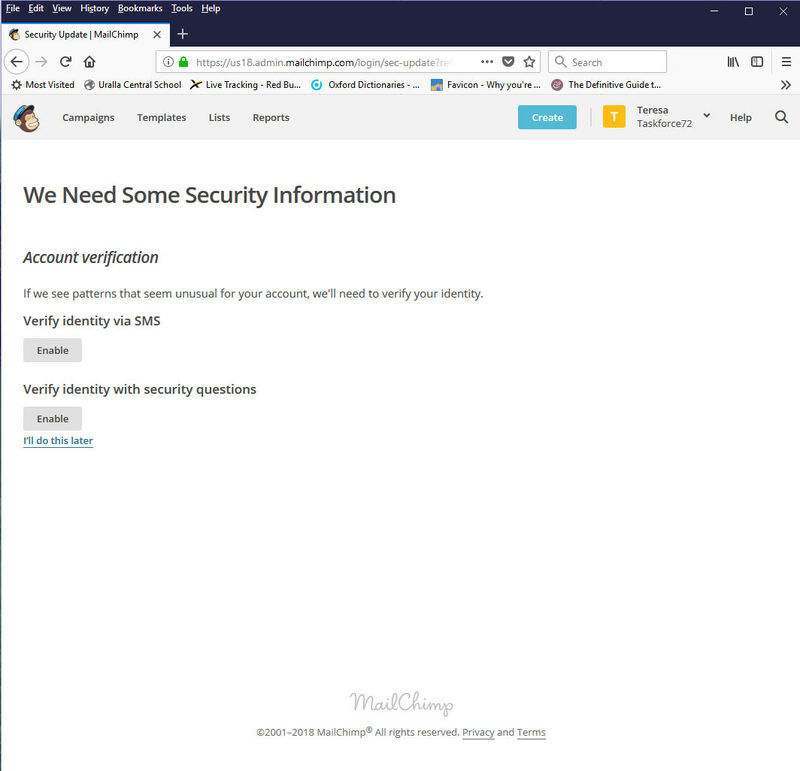 Then fill out the relevant details – Email address, first and last name are sufficient, however for interest sake you may also wish to add country. Click on the “This person gave me permission to email them” check box. This is so they won’t get the confirmation email, but doublecheck you have their email and name entered correctly. 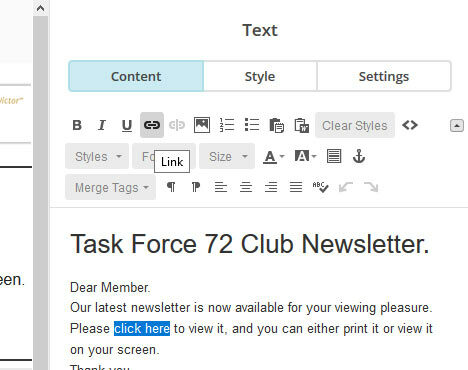 As new members to the club join and give you their email address, you would add them to the “Member” list.